Owners of Avant Gardner are trying to open a 6,000-person venue in East Williamsburg. EAST WILLIAMSBURG — The party promoters who were shut down multiple times for safety and fire-code violations and once tried to host a rave at a toxic Greenpoint site are making another effort to open their venue. 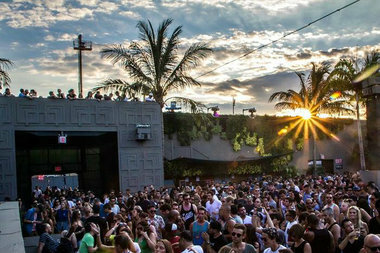 Billy Bildstein, one of the organizers behind Zurich-based promoters CityFox, has been trying to open Avant Gardner, also called Brooklyn Mirage, at 111 Gardner Ave. since last spring. He appeared before Community Board 1 this month, urging members to support his application for a liquor license. "I want to apologize to you, the community, about many things we could have done better," he said at the board's Feb. 15 meeting. "We made mistakes and we didn't do our homework right before we approached the board last year. I know we didn't make a very good impression last year, and we’re here to show you the improvements." Bildstein's plans for the 6,000-capacity venue include safety and traffic analyses, as well as a sound study for the multipurpose event space he hopes will play host to concerts, photo shoots, art exhibits, fundraisers, fashion shows, corporate events and galas. The venue would hire 171 Brooklyn workers and generate $7.2 million in labor income, according to plans submitted to the community board. The plans also promise to invest in a "neighborhood beatification plan" that would commission local artists to paint murals on 15,000 square feet of empty walls in the industrial area around the site. The venue, described as "the most spectacular outdoor and indoor event space in New York City," will feature a restaurant serving tacos, pizza and German street food and will be decorated with 15,000 live plants and 35 palm trees, according to the application. Avant Gardners's plan, which is now backed by 24 local politicians, community organizations and religious groups, will cost $47.2 million in total purchase and development costs, organizers said. "We’ve shut them down badly and you know what? That shows a lot when you go down and you come up and face this crowd," said state Assemblywoman Maritza Davila, speaking on behalf of the venue at the meeting. State Sen. Martin Dilan, City Councilman Antonio Reynoso and Borough President Eric Adams also voice their support for the project. Last year, the owners spent $60,000 with the lobbying firm State & Broadway Inc in an attempt to sway city councilmembers, state records show. A review of city and state campaign finance records showed no donations to local representatives from Bildstein. Issues with CityFox in North Brooklyn date back to 2015, when the promoters hosted dozens of parties at 99 Scott Ave. with a catering license that allowed them to avoid applying for a full liquor license. Getting a liquor license would have require them to go before the community board. Then, on Halloween that year, they tried to throw a party on a toxic Superfund site in Greenpoint that was shut down by fire marshals. While the state later found the site's owner at fault for the aborted rave, the would-be event still left a sour taste with many. The promoters already had several events planned last spring when they began to apply for a full liquor license at 111 Gardner Ave., but police showed up and confiscated their alcohol in late May. A few weeks later, buildings inspectors shut down the whole operation with vacate orders, citing a slew of safety violations including wooden platforms and decks that didn't appear structurally sound, gas piping that had been installed without a permit, extension cords being used instead of permanent wiring, plywood structures that weren't fire-rated and no evacuation plan. The community board, which has an advisory role in the granting of liquor licenses, will vote on Avant Gardner's application at its full board meeting on March 14.